What are the financial advantage of U.S. homeownership? · Leverage: Investing in real estate can provide superior gains. · Long-term, fixed-rate home loans: These substantially lock in monthly housing costs (as opposed to rent, which continues to rise) and can be refinanced when the opportunity arises. A low rate can make a huge difference in monthly housing costs. · Multiple homeownership tax deductions: These include the mortgage interest deduction, which basically subsidizes monthly housing costs. Along with low interest rates and ongoing principal repayment of the loan, this makes net monthly homeownership comparable to and often less than the cost of renting the same home. Check our Rent vs. Buy Calculator. · The huge capital-gains exclusion on the sale of a primary residence: This is to the tune of $250,000 for singles and $500,000 for couples. This rare investment allows you to walk away with large, untaxed profits. 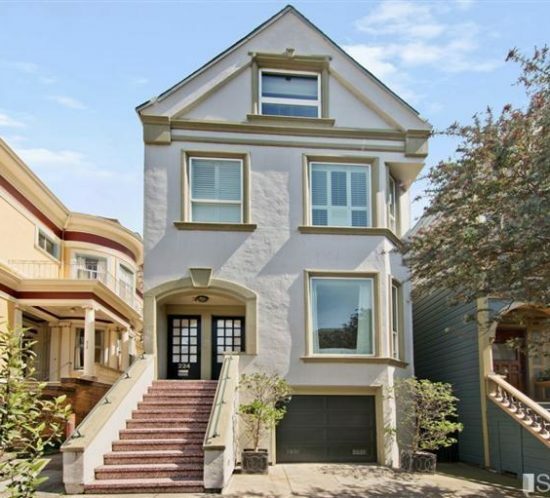 Wondering about your own piece of San Francisco paradise? Get in touch. 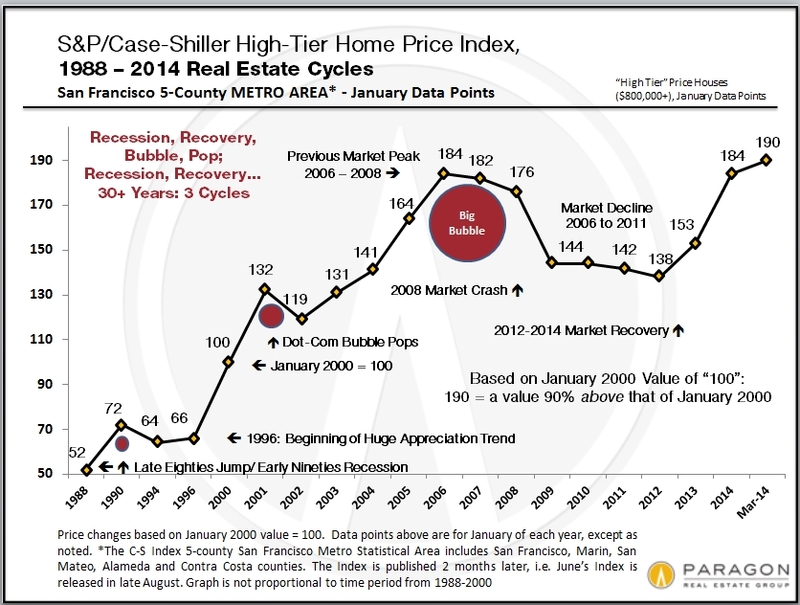 Is the Bay Area real estate market a better bet than the S&P 500? That question is the subject of Paragon’s recent report, which details a 20-year comparison of return on investment. 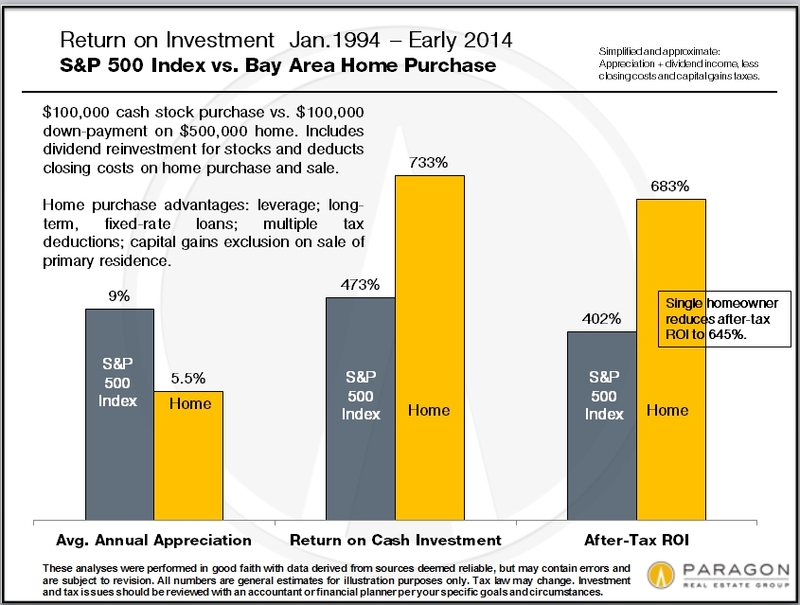 The analysis look at the comparative investment returns of buying a Bay Area house, gold, Apple stock, an S&P Index fund or putting money into a bank CD. Now, let’s face it: Stock and house prices can’t be compared apples to apples. 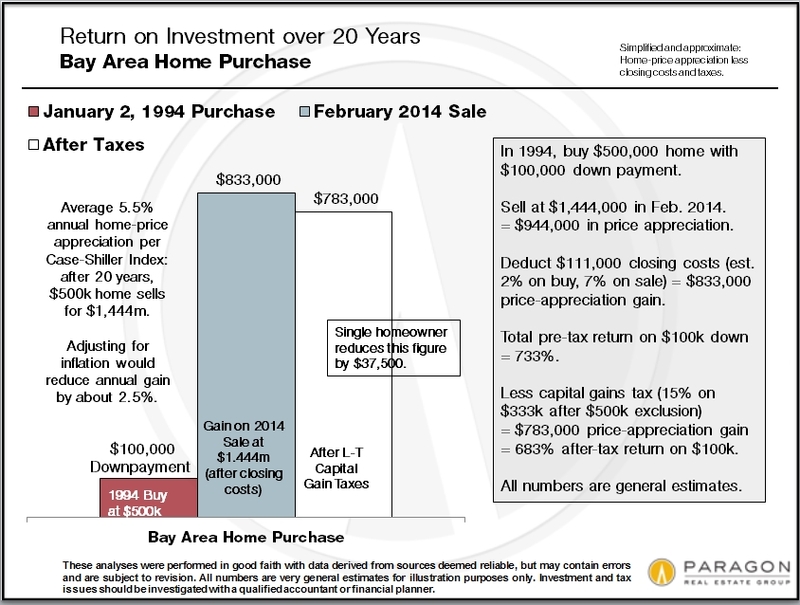 What Paragon has done here has made a simplified, good-faith illustration of the investment of $100,000 in January 1994, having chosen February 2014 as the home sell date since that is the last published Case-Shiller Index (as of May 20, 2014). In hindsight, 1994 was an excellent time to put money into the stock market. 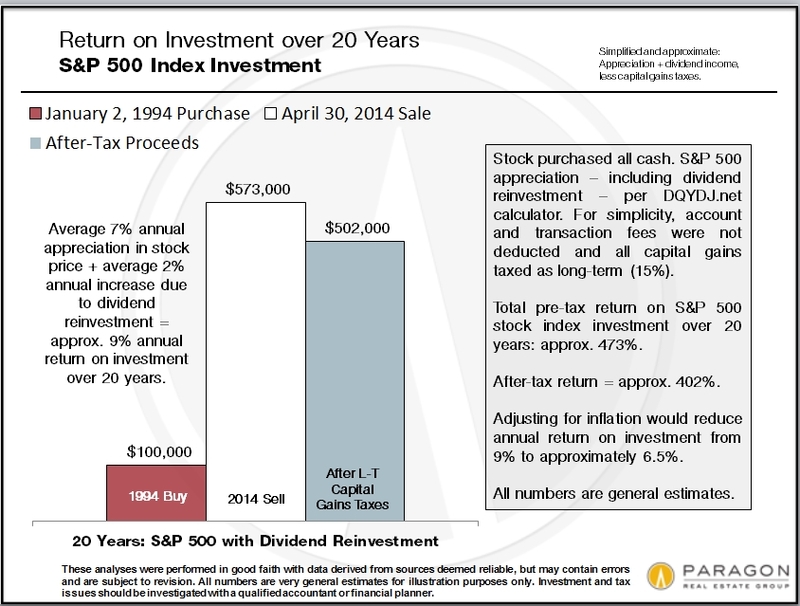 If you include dividend reinvestment, the S&P 500 went up approximately 9 percent per year for a total of 473 percent over the 20-year period. 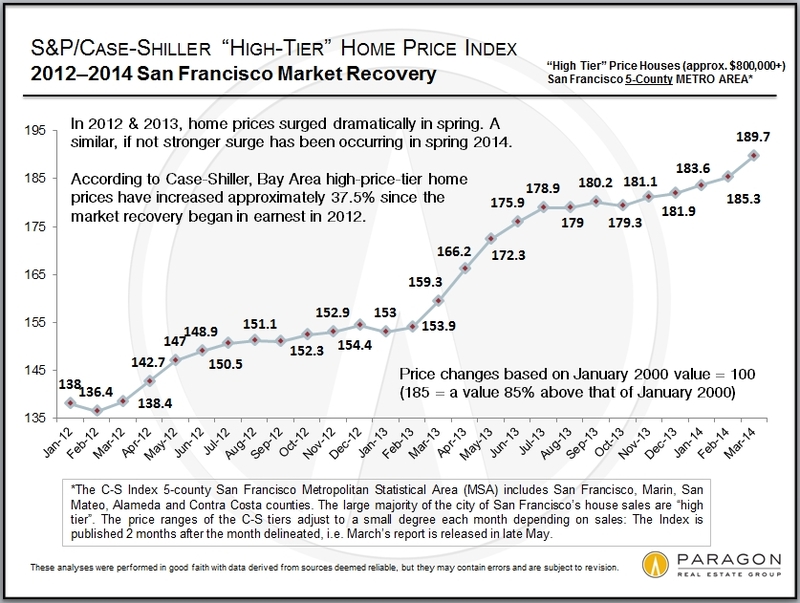 Meanwhile, Bay Area home prices went up much less than the S&P during this period – about 5.5 percent per year for a total of 189 percent. That said, the return on cash down-payment investment would be about 733 percent – a significant outperformance of stocks. This difference only increases when you look at taxes on gain. Tomorrow we’ll look at the financial advantages particular to American homeownership. 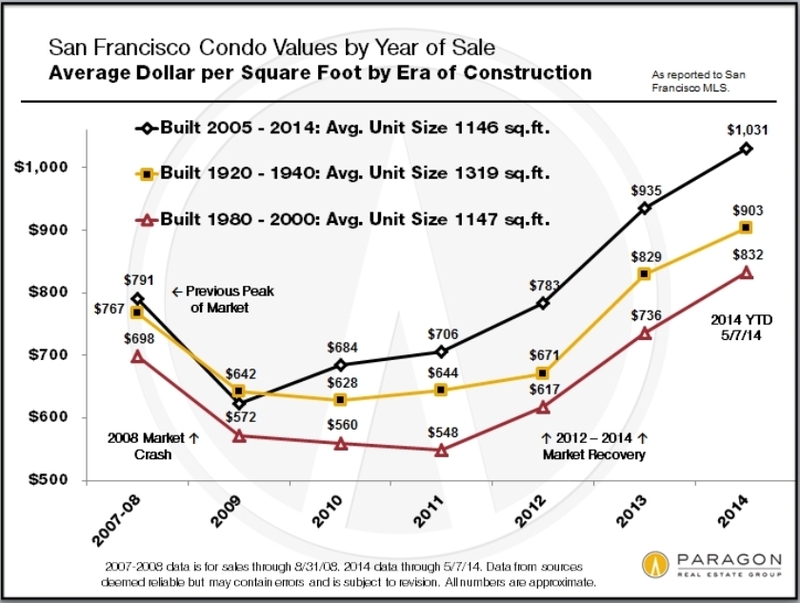 With lack of inventory at historic lows, San Francisco condominium prices continue to press northward. That’s according to the San Francisco Business Times, which reports that condo prices went up 19 percent in April as compared to last year, hitting an average of $1,115 per square foot for new construction. The report was based on research by condo marketing and research firm The Mark Co. 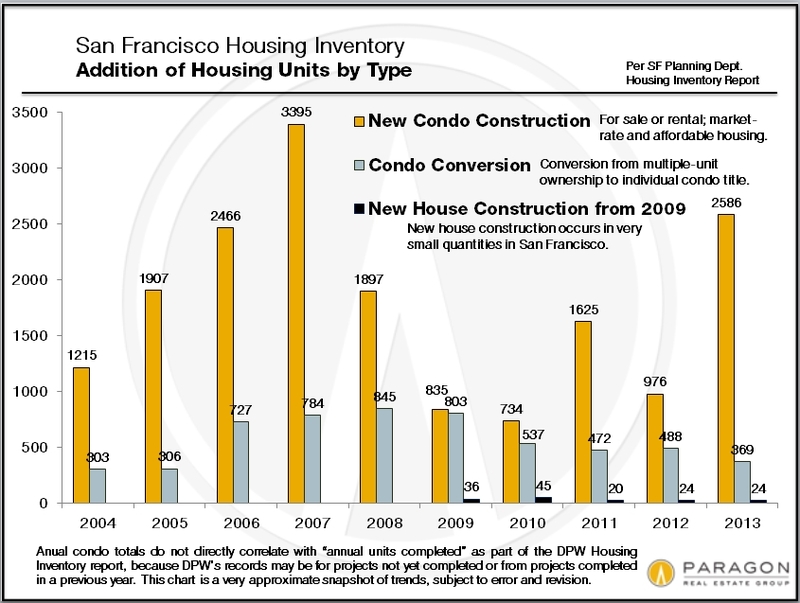 However, Kennelly added, a large bulk of new condos set to come online this year could ease the inventory crunch. 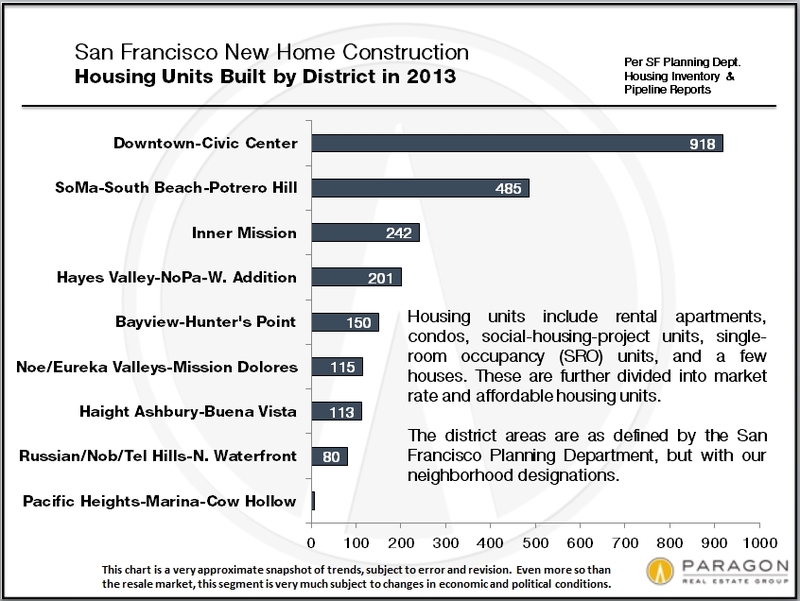 Those include the Linea project at 1998 Market Street (115 units) as well as Vida at 2558 Mission Street (114 units). Other developments set to come online later this year include Amero (27 units), Arden (267 units) and Lumina (665 units). 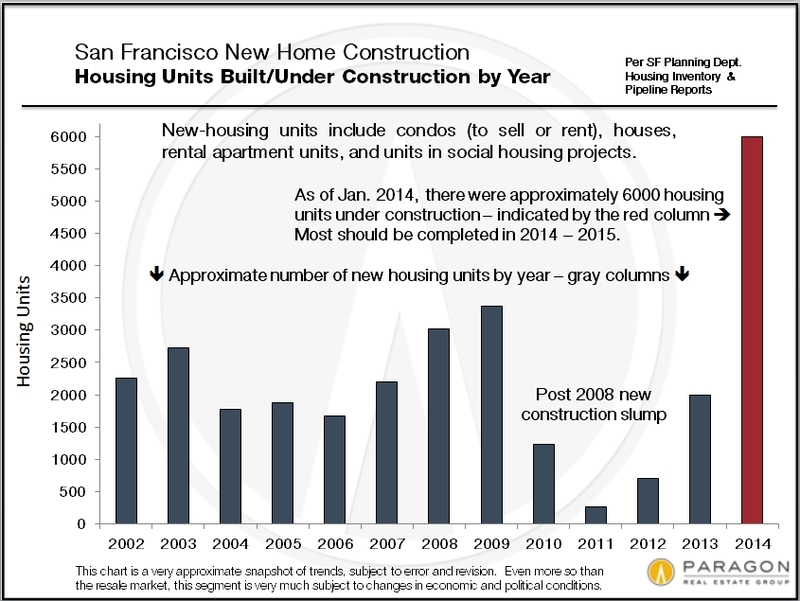 But this year, less than 1,500 condos will come online. In contrast, more than 5,000 new apartments will be finished and ready to be leased. 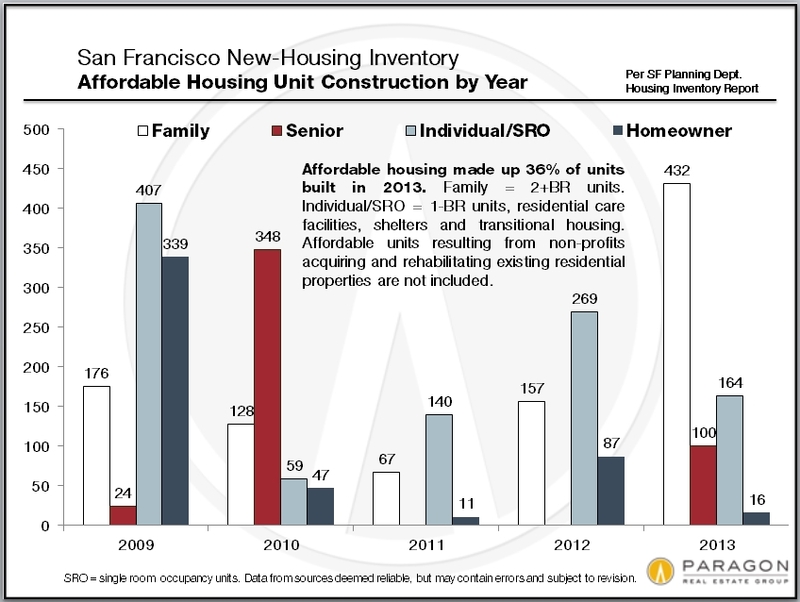 This traces back to a few years ago, when it was easier to finance apartments than condos. I’m happy to announce that 451 Kansas Street #458 has just been sold for $1,025,000. This two-bedroom, two-bathroom condo has a washer/dryer, closets for days and parking for a single car. This professionally managed building has HOA dues of $503.33 per month. With the bedrooms set to either side of the living room with their own ensuite baths, this condo has an ideal floor plan with extras including walk-in closets, hardwood floors, stainless GE Profile appliances, closet built-ins, glas shower doors and custom window coverings. 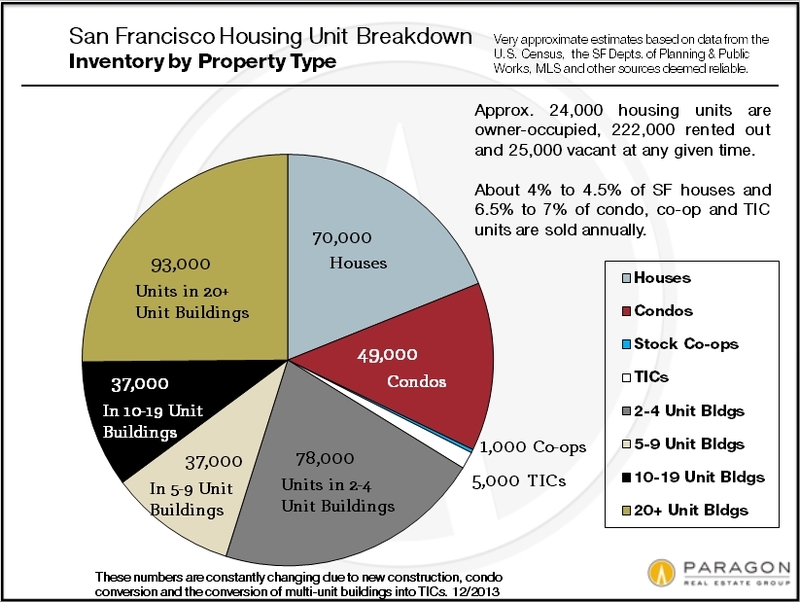 As for the building, known as the Whole Foods Building, The Potrero has 140 condominiums divided between two buildings with mature landscaped courtyards, a fully equipped gym and spectacular roof deck with city views. 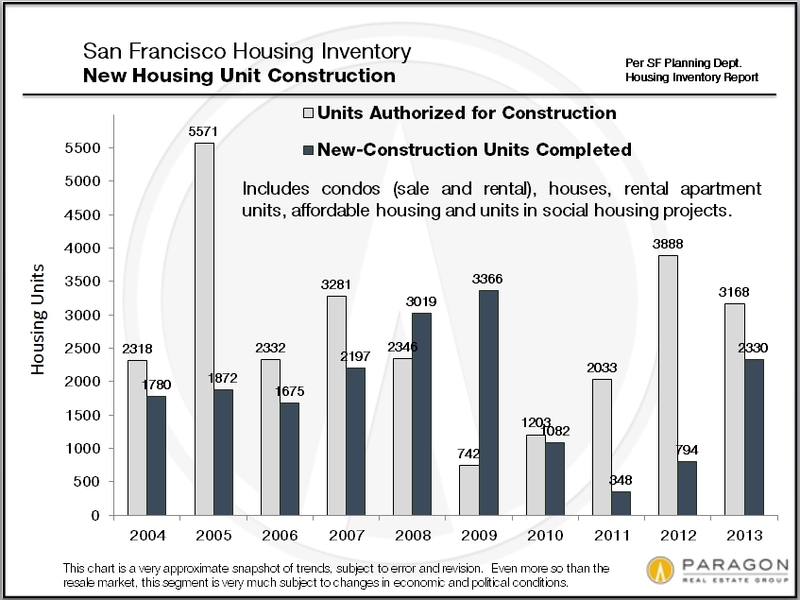 Let’s continue our discussion of new construction in our fair city – specifically, housing construction. 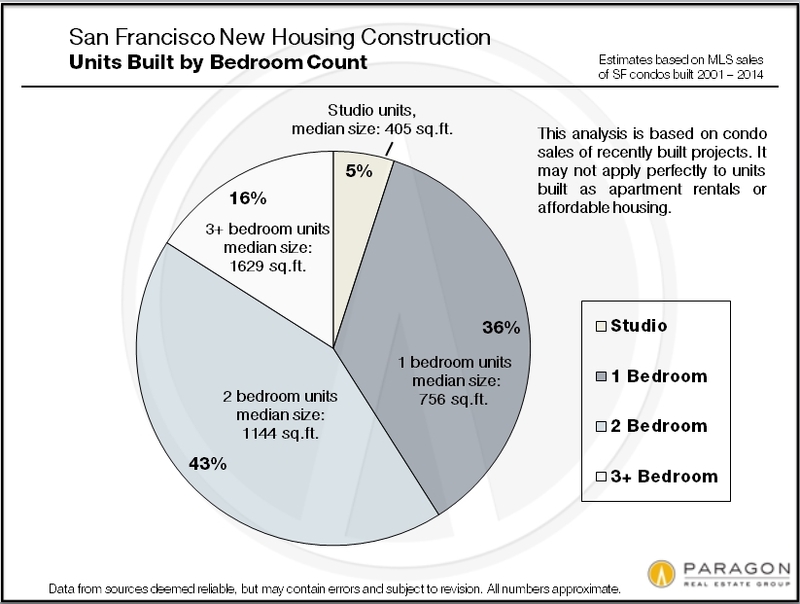 Paragon’s latest Housing Development Report finds that almost all of the projects in today’s pipeline have at least a partial residential component, with only 8 percent specifically non-residential developments. And the beat continues rolling on. 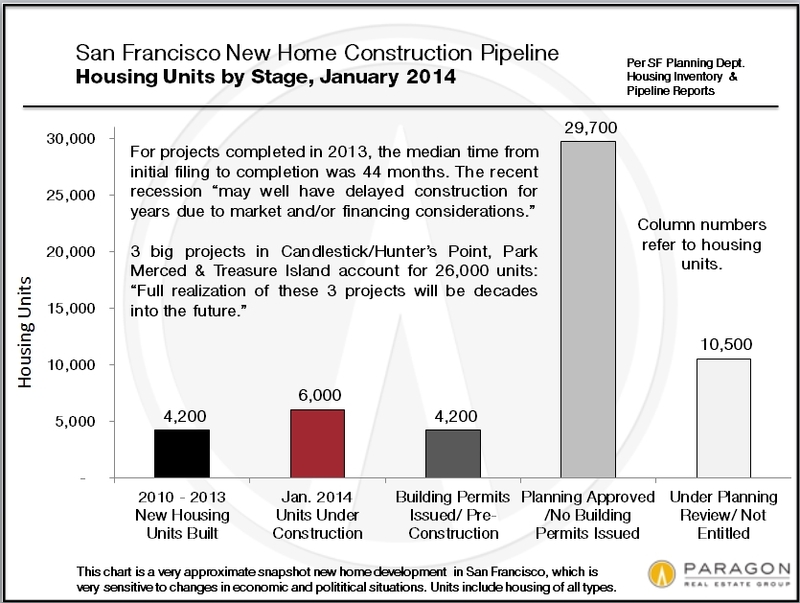 In the second week of May, Van Ness denizens Honda and KRON were reported to be on the chopping block in favor of large-scale residential projects. Looking at the last seven years of MLS sales of condos built between 2001 and 2014, we find that the smaller the unit, the higher the dollar per square foot value on sale or rental. That said, in San Francisco, three-plus bedroom condos are often high-floor units with extraordinary views that sell for equally extraordinary amounts. However, these are exceptions to the general rule. It seems as though the city plan has a bias for two-bedroom units. 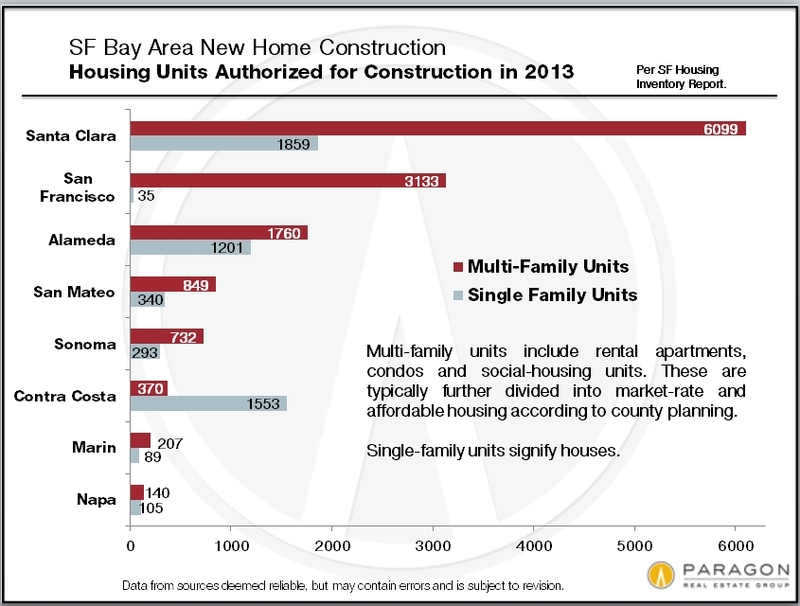 It designates these as “family units” – but Paragon wonders if this isn’t a bit of an anachronism since nearly 40 percent of city residents live on their own and San Francisco has the lowest percentage of children in any major American city. 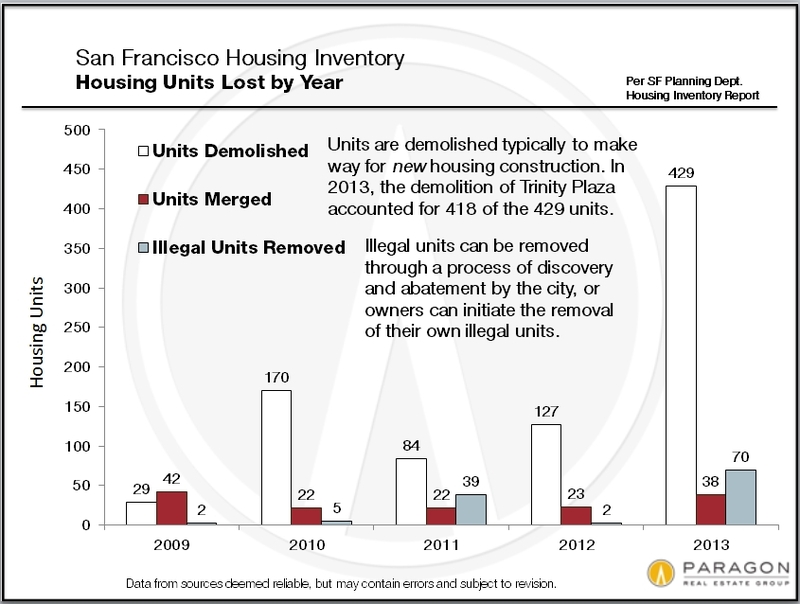 Things started changing in 2012, though, when they city consented to allow the construction of 375 micro-units, which are apartments of 220 to 300 square feet, including kitchen and bath. It will be intriguing to keep tabs on this trend to see if it takes off – or not – in both rental and for-sale markets. We’re seeing most construction on or near Market Street, where many young high-tech residents are congregating, but will that change? Stay tuned.